Our company ‹ Boldizsár Trans Kft. Ever since Boldizsar Trans Ltd had been established in 2004 we are proud to be developing our operation every year. With on the road and in our office we offer reliable services with a 20 strong team of employees. Our company’s main profile is haulage and freight forwarding. 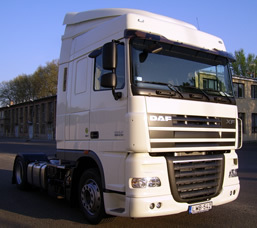 Our international fleet of vehicles meets the highest European environmental requirements. The 10 articulated units are circluated between Great Brittain and Hungary with precision operation. All of our semi trailers are mega structured with 3 meter internal height, equieped with slidding curtains and elevating roof. We are proud that the fleet is registered to transport hazardous cargo and all of our international drivers are also registered to handle hazardous shipments on road. The company is succesively growing and improve the fleet in a short time and reach a higher succeeding from year to year. Our aim is to serve our clients accurately with continously updated vehicles. Copyright © 2012 Boldizsár Trans Kft. - All rights reserved!